Erla aircraft have the most distinct markings and pattern of them all. On these, the canopy is in RLM 74 grungrau (grey-green) , but the plate in front of the windscreen is very often in RLM 75 grunviolett (grey-violet), leaving a "gap" of RLM 75 between the RLM 74 on the windscreen and the engine cowling. Also, very distinct is the spotty mottle, very typical for Erla. The crosses on the under surfaces of the wings has the thin black outline which neither MTT Regensgburg nor WNF aircraft does. Erla built aircraft carries the saw-toothed camouflage pattern. Note-later RLM 81 braunviolett (brown-violet) and RLM 82 lichtgrun (light-green) were used instead of RLM 74 & 75. The undercarraige was usually RLM 65 (hellblau - light blue). The masking set comes in a clear zip-locked cello bag. 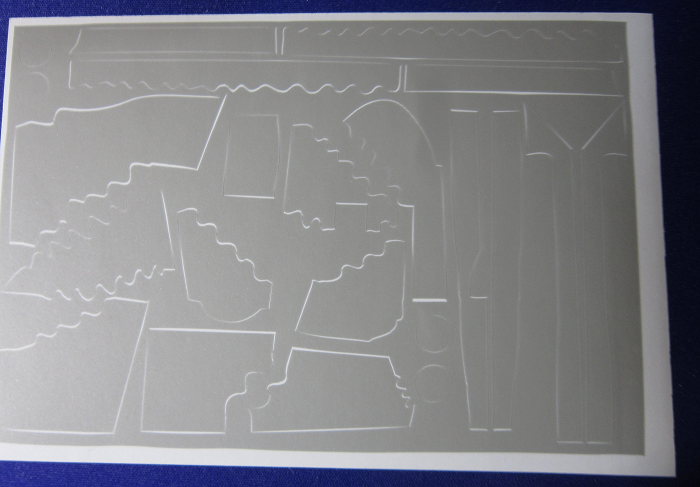 It contains the instructions, a grey vinyl die-cut sheet of self-adhering masks, with a stiff sheet. 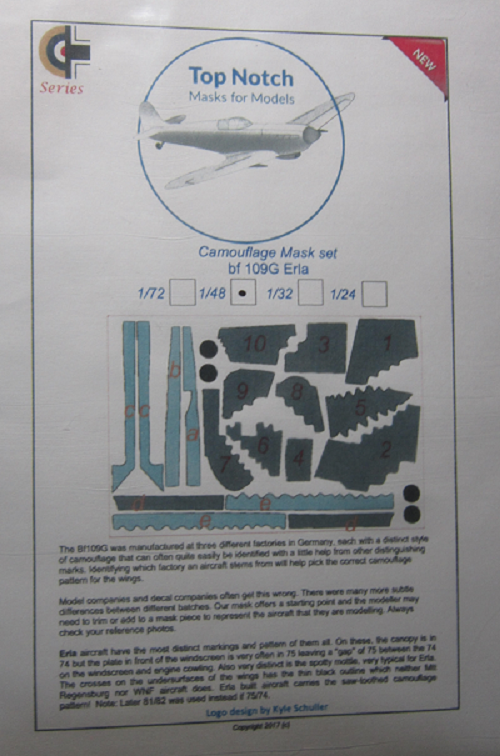 On the left side of the instructions is a 2-view of a Bf-109G Erla showing its side and top. Captions tell where to apply the masks. A small illustration of a WWII poster appears. It shows a woman flexing her bicep and WE CAN DO IT!